We know many enterprise networking teams still struggle to shift away from their incumbent network infrastructure, even if it’s the right decision for the company. This Forrester Research report addresses eight common statements that organizations use to rationalize their choices and criteria. 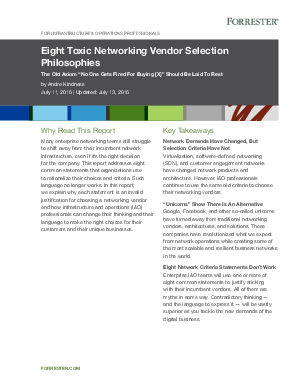 Download the report to discover why each statement is an invalid justification for choosing a networking vendor and how infrastructure and operations (I&O) professionals need to change their thinking and their language in order to make the right choices for their customers and their unique business needs.